In the 1940s, the federal government sent a group of gifted photographers across the United States to record and publicize conditions in cities, towns, and rural areas that were the destination of an unprecedented migration. Two of these photographers, Russell Lee and Edwin Rosskam, spent time on Chicago’s South Side, eventually producing over a thousand documentary images of Bronzeville’s life. This remarkable coverage of a black urban community—the only significant collection of photographs of black Chicago during this pivotal era—has largely gone unpublished until now. In over 100 handsome full-page black-and-white photographs of bustling city streets and sidewalks, prosperous middle-class businesses, thriving cabarets, as well as dirt-poor migrants from the deep South, this stunning tribute captures the vitality of a city whose burgeoning black population produced a vibrant and sophisticated culture now familiar worldwide. 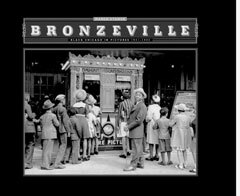 With original essays on the migration and the photography project, and contemporary commentary by Richard Wright and others, Bronzeville is a unique and exceptionally beautiful evocation of one of the defining moments in American cultural history. Maren Stange is a professor at the Cooper Union in New York City. She is the author of Symbols of the Ideal Life and a co-author of Official Images. She lives in Brooklyn, New York.